Meanwhile, action. While Ruth and Naomi waited, Boaz was busy taking action. He set about to do exactly what he said he was going to do. Read Ruth 4:1-2. 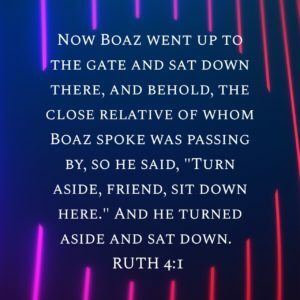 Now Boaz went up to the gate and sat down there, and behold, the close relative of whom Boaz spoke was passing by, so he said, “Turn aside, friend, sit down here.” And he turned aside and sat down. Boaz knew and understood that there was a closer relative who could redeem Ruth. However, he also knew that relative was not aware of the situation and did not understand all that was involved, so he set out to find that relative. During that time, business was conducted at the city gate so the best place to find people was there at the gate. That’s where Boaz found this man. While there, Boaz also knew that he needed a group of witnesses to be able to conduct business. So he gathered ten other men around so they could discuss and transact business. Boaz took action, but it was action that was thoughtful and exactly what needed to happen. When we take action, are we taking action with purpose? Do we know exactly what we expected to have happen from the action we’ve taken? Actions should never be haphazard or thoughtless. God has a plan for us and if we are following him, we will see the actions that we take lead us directly where he would like us to be. Will we take action on what he has given us to do today?